Please Note:We are closed Thanksgiving, Christmas Eve, Christmas Day and New Year's Day. Check out our model Christmas Market outside in the beer garden, then come inside our banquet space for a real Christmas market! Local artists, hand-made crafts and products including fiber arts, jewelry, jams & jellies, soaps and lotions, cookies & bread, books, candles and more! You're sure to find an affordable treasure for the perfect gift! Of course, the Black Forest Inn will be selling stuff too - t-shirts, mugs, gift certificates, coffee beans, mustard, cookies, marzipan and anything else you can think of to give as a gift! 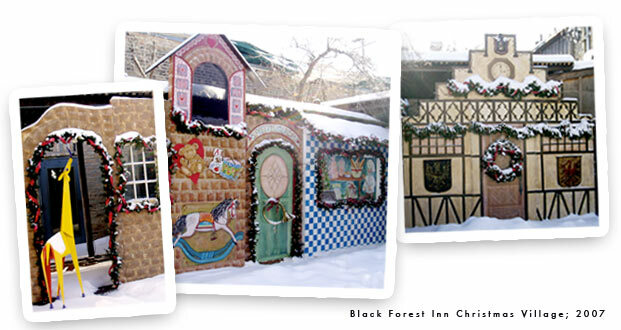 Fridays in December are days of giving at the Black Forest Inn. Join us each Friday, as - with your help - we make charitable donations to a few causes and organizations that work with immigrants in our community. We will be donating 20% of our food sales on those days -so the more you eat, the more money they get! Every Wednesday leading up to Christmas we are going to make a super special hot chocolate – only available on Wednesdays! We will have a deal on Glühwein with a Black Forest ceramic mug! We will have a featured beer with samples and prizes! And we will light up the fire pit out in the beer garden! Complete meals for groups that you can pick up at your convenience! We are offering seasonal specialties like Goose, as well as Black Forest favorites like Rouladen, Roast Pork and Bratwurst. Meals include bread, side dishes and dessert. We'll have everything ready for you to pick up before your party! » see the previous contest winners! Day One: Ginger Thinsa crispy, spicy cookie to have with coffee or a cold glass of milk! Hennepin History Museum is dedicated to bringing the diverse history of Hennepin County and its residents to life through exhibitions, library, collections, public events, and educational programs. Currently on view is an exhibit called Eat Street 20: in their own words. “How did Eat Street, the length of Nicollet Avenue famous for its range of delicious destinations, develop? Who were the men and women who built these businesses, and how did they shape the street? How has the neighborhood changed over the years? This exhibition turns the spotlight on the evolution of one of Hennepin County's favorite streets.” Go see the exhibit and then join us this Friday when we will be donating 20% of our food sales to them! The more you eat, the more money they get! Day Two: Russian Tea Cakesthese nutty, buttery, sweet cookies are a must for the holidays! Day Three: Linzerdecadent bars of buttery-nut crust and raspberry filling. Day Four: Black & White Spritzthese giant, rich cookies are a swirl of delicate almond & dark chocolate flavor. Day Five: Lebkuchenthese spicy, honey-sweetened bars are a Nürnberg specialty. Day Six: Marzipanan almond-y confection shaped into cute little lemons and other fruits. Get a super special hot chocolate today only! Get a deal on a Black Forest ceramic mug filled with glühwein – take the mug home: $12! Featured beer today:Utepils Alt bier! Spend some time outside by the fire pit! Day Seven: Stollenflavorful, fruit-studded holiday bread. Day Eight: Chocolatesrich, smooth, chocolate ganache-filled, bittersweet chocolate cups. The Bdote Learning Center develops culturally aware, successful, high performing students by providing them with an academically rigorous education that is place-based, and rooted in Native language and culture of indigenous peoples. "Bdote" is the Dakota word for the confluence of the Mississippi and Minnesota Rivers (also called Pike Island at the Ft. Snelling state park) believed to be the origin place of Minnesota's first peoples. They also see it as a metaphor for the coming together of the best of Native and western knowledge. Join us this Friday as we will be donating 20% of our food sales to them so the more you eat, the more money they get. Day Nine: Nut Strudela rich confection of mixed nuts, sugar and spices. Come shop the variety of local artisans, craftspeople and collectors. Browse jewelry, textiles, paper, soaps and lotions, books, artwork, and, of course, Black Forest Christmas cookies and other treats. It's bursting at the seams with affordable treasures to give as gifts or to keep for yourself! Day Ten: Sugar Cookiessoft, sweet, charmingly decorated… what's not to love? Day Twelve: Springerlethese are beautiful, pale, anise flavored cookies, embossed with lovely images. The grand finale! Get a super special hot chocolate - today only! Featured beer today: Bent Paddle! Featured beer today:Barley John's Old 8 Porter! MAD DADS, Inc. was founded in May 1989 by a group of concerned Omaha, Nebraska African-American men and parents. They strive to present themselves as positive role models and concerned loving parents who are a visible presence in communities against the negative forces destroying children, families and neighborhoods. MADDADS is an Acronym: Men Against Destruction, Defending Against Drugs and Social Disorder. Join us this Friday as we will be donating 20% of our food sales to them so the more you eat, the more money they get. 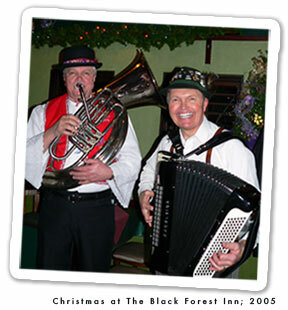 Live Music!Eric Ray and Jim Strehlke from Alpensterne!